This year, the Teen Lifeline staff made a goal to bring you more resources by posting on our blog at least once a week. We are excited about the content that we are able to provide and want to continue to improve! Below, you will see a link for the “Reader Survey.” Will you please take a few minutes to fill this out? By giving us feedback, you are helping us put out content and resources that are relevant to you! Is there a topic you wish we would cover? Check out the survey. Do you have a suggestion for how we can make this better? Tell us in the survey. 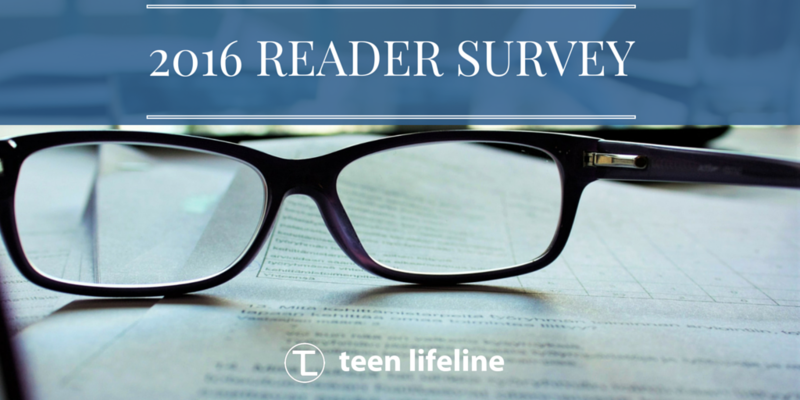 Are you so excited about the Teen Lifeline blog that you can barely stand it? We want to here from YOU in the survey! Thank you in advance for subscribing and supporting the Teen Lifeline blog! We have an exciting announcement coming soon that will bring you even more resources – make sure you are subscribed so you won’t miss out!